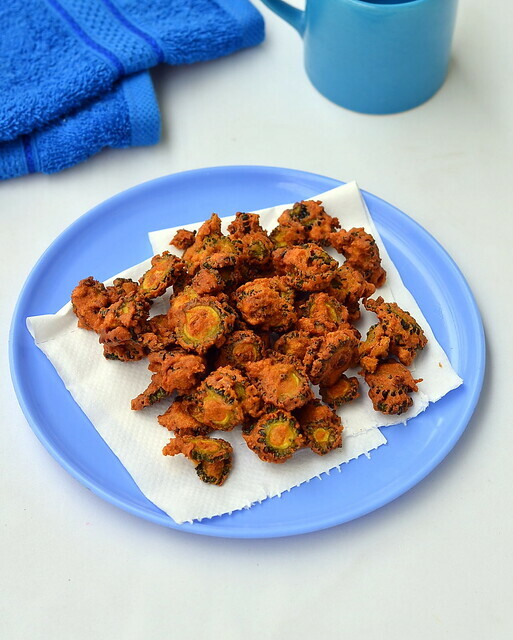 My MIL make this crispy bitter gourd fry very often next to Pavakkai Pitali.Last week when i saw the Pavakkai fry picture shared by SPR sir of Food-fun-friends group in facebook,i got tempted to try at home and told my MIL.Basically Iam a big fan of bittergourd recipes even though it tastes too bitter.We never try to remove the bitterness of it and we love to have it as such.I guess you all know the various health benefits of bitter gourd.The best among them is bittergourd is good for diabetes.So we try to include this veggie in our cooking at least once in a week.Recently my in-laws have planted a bittergourd creeper plant in our Salem house backyard.So I made this crispy fries using our own Pavakkai .It was very tasty as it was home grown.This fries is a great tea time evening snack and a good side dish for variety rice & curd rice.Do make this South Indian style crispy bittergourd fries recipe and enjoy !Very soon I will share pavakkai poriyal recipe. too. Wash and slice the bitter gourd to a very thin roundels.The key to get crispy bitter gourd fry lies in cutting the slices.So slice it thinly. 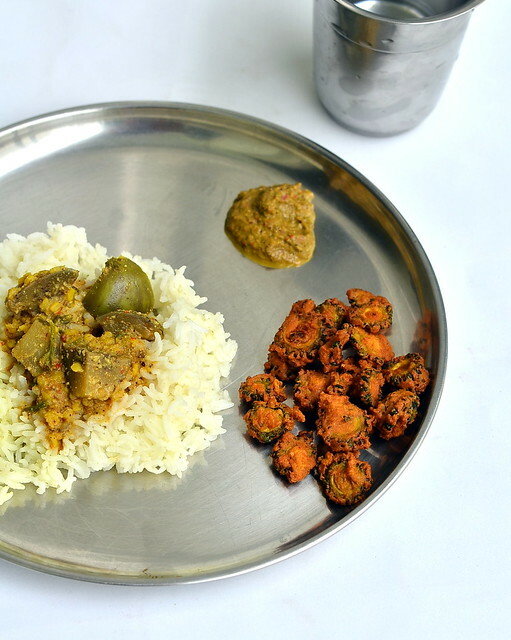 If u want to remove the bitterness of bittergourd to a certain extent,follow this step.Add 2 tbsp of curd + salt and mix the bittergourd well.Leave it aside for 10 minutes.It will start to leave water,Squeeze the bittergourd pieces and discard the water.Now pavakkai pieces look dry without any water.If u don’t want to remove the bitterness,skip this step and proceed to the next one. 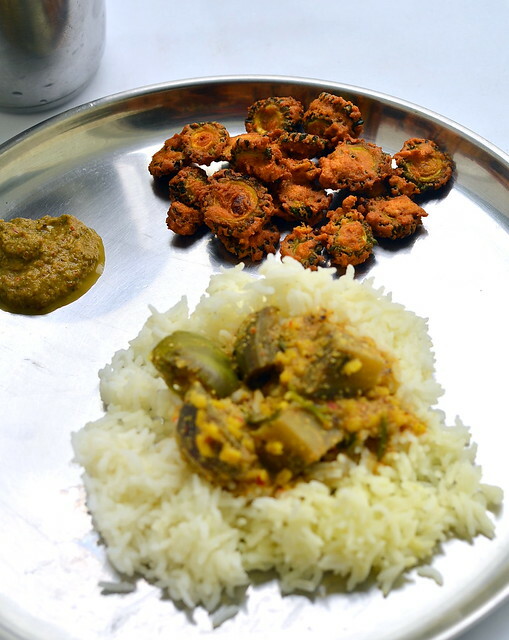 Take the bittergourd pieces to a bowl.Add curd,salt,turmeric powder,sambar powder or red chilli powder,besan flour and rice flour.Mix well.Sprinkle very little water using a tbsp and coat the BG pieces well with masala.Add little more besan flour if u need.Check for taste and add more red chilli powder and salt if necessary. Heat oil to deep fry.Check the temperature of oil by dropping a pinch of batter,If it rises immediately to the top,simmer the flame and and put the bitter gourd pieces into the oil in a sprinkled manner. Deep fry both the sides till it turn crispy and golden brown.Enjoy with rice or as evening snacks with tea/Coffee! Replace sambar powder with red chilli powder. Skip the soaking part if u don’t want to remove the bitterness of bitter gourd. You can replace rice flour with corn flour too. 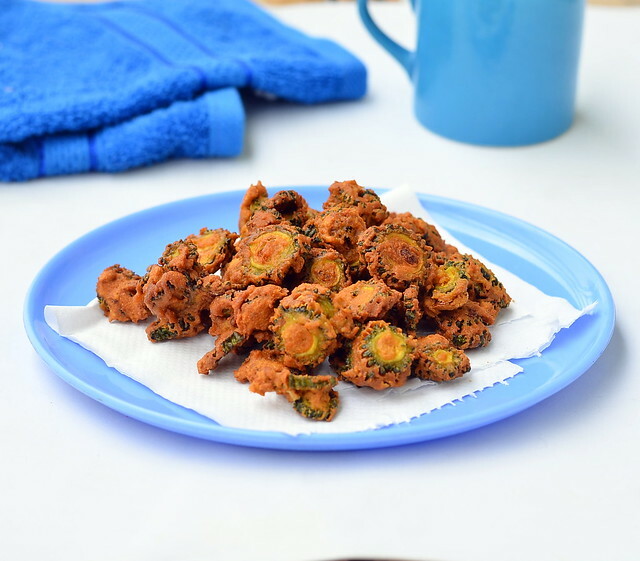 Try this easy,crispy bitter gourd fry for evening snack or as a side dish for rice.Serve hot to enjoy its best taste ! 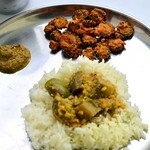 We had with brinjal rasavangi.It was yum !